These zodiac charts were made by “harnessing the power of the universe,” designer Archie says. How have you been, astrologically speaking? If you're not sure how to answer that question, these zodiac charts might be helpful to you—and if you are sure how to answer that question, they are probably right up your alley. 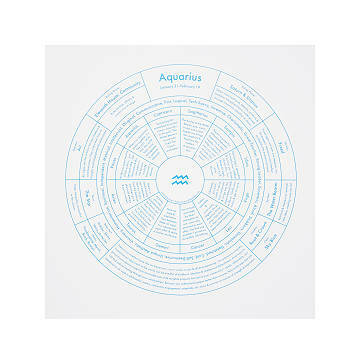 Using a colorful, just-for-us color palette, designer Archie Archambault and astrologer Clare Kritter have created frame-worthy charts for each zodiac sign. Not only will the 11x11 prints look fabulous on your wall, but they'll also tell you how you interact with other signs, your ruling house, and more—all based on your birthday. Speaking of, a print would make a thoughtful gift for anyone on your list. Made in Oregon. When you’re struggling to make sense of it all—find Archie Archambault. He makes the world easier to understand by creating charts and maps of everything from small cities to the entire solar system. His latest project? Getting to know the cosmic forces behind birthdays. With the help of professional astrologer and herbalist Clare Kritter, he has fully charted out each zodiac sign in a particularly frame-worthy fashion.